This year I am in Kate's Birthday Block Swap on the about.com quilting forum. This is a swap where 12 women choose a theme for blocks they would like made for them, and then when it is their "birthday" month, the other 11 women in the swap send them a block. Deb was first up this year (starting in July), and chose pastel stars floating on a background. She let the maker choose whichever block we wanted to make. This is the block I made her. This star is called Golden Samovar, and the pattern is found in Judy Hopkins' book, "Once More Around the Block". This is her third book where she gives the cutting sizes for many, many blocks, and I have all 3 books. They are great reference books for those of us that don't like to follow pre-made quilt patterns. The block looks fantastic. Great inspiration for me as I am also in your group for the swap - May 2009. I also have that book so will have a look to see if I can find a good block to work with yours.I am sure Deb will love it! Sorry but a couple of questions - is your background solid black? and did you rotary cut the block or paper piece? I'm a very nice Mormon Mommy that reads your blog now and again. 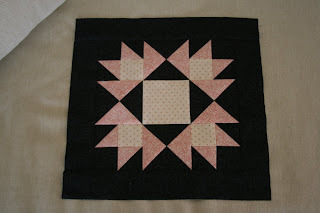 Beautiful block, Ginger... lover the way the star appears to glow in the black fabric. What a great block. I love it. sounds like a fun swap. great block.